A yellow taxi in New York. Image via MaxPixel. Public domain. Sian Green lost her leg to an out-of-control New York City taxi nearly six years ago. Initially seeking $27.5 million from the city and a cab company, Green was forced to settle with $150,000. A British woman was awarded a paltry sum nearly six years after losing her leg in a gruesome taxi accident. The lawsuit initially sought $27.5 million. Last week, Sian Green and her attorneys settled for much, much less: $150,000. “This is a really horrific story,” he said. The crash, writes the New York Daily News¸ occurred in August of 2013. Then-23-year-old Green was vacationing in Manhattan when a bike messenger and taxi driver got into a heated argument. Moments later, the cabbie went off-road on Sixth Avenue, plowing atop a sidewalk near the Rockefeller Center. Green, recounts the Daily News¸ was eating a hot dog when the taxi ran into her. Pushed back against a fountain, the woman almost bled to death on the spot. Her leg was later amputated. The lawsuit, lodged against New York and the taxi driver, argued that cabbie Faysal Himon had such a bad driving record that his license should’ve been revoked. Himon, Marchese wrote in a 2014 document, had seven points on his license for motor vehicle violations. And seven points, in New York, should’ve been sufficient to trigger an automatic license suspension. 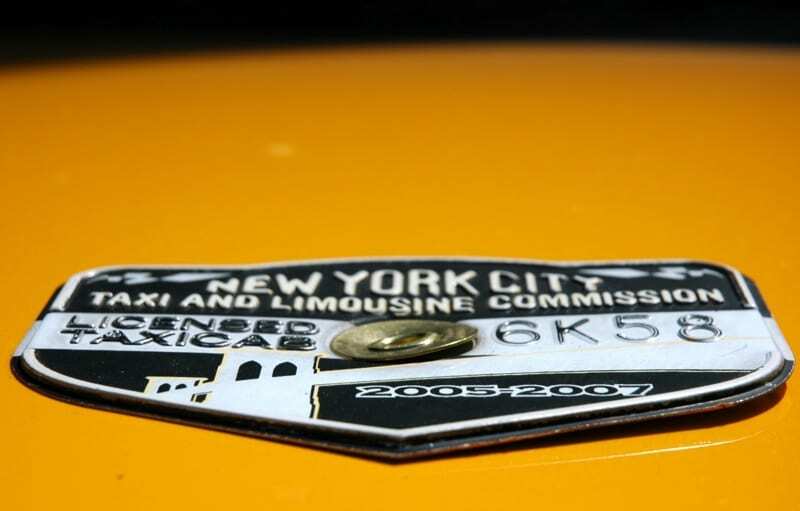 A TLC taxi medallion affixed to a New York City taxi. Image via Wikimedia Commons/user:Danielle Lupkin. (CCA-BY-2.0). However, the Taxi & Limousine Commission didn’t act; they said their system has been compromised by poor-performing software. “The [TLC} should have suspended his license BEFORE the time of the accident,” Marchese wrote. The glitch allowed several thousand taxi drivers to continue driving when their licenses should’ve been temporarily revoked. The Daily News notes that most suspensions only last 30 days. Marchese said he and Green decided to sue for $27.5 “by looking at past jury decisions and settlements on people who had lost their limbs.” Along with a leg, Green wasn’t able to work for months after the accident. According to the Daily News, Green made a decision to discontinue her lawsuit late last month. By then, the struggle against the city and Shoe Taxi Corp. seemed futile. The entirety of the $150,000 settlement was paid Shoe Taxi Corp., which owned Himon’s cab. Marchese’s statements indicate the low settlement amount may correspond with the waning profitability of New York’s traditional yellow cabs. “The medallion is worth nothing,” Marchese said, noting that ride-share companies like Uber and Lyft have driven down demand for cabs. In New York, licensed cab companies were awarded ‘medallions’—indicators of certification attached to taxis and backed by the Taxi & Limousine Commission. Once worth upward of $1.3 million each, the value of medallions has plunged to about $100,000 amidst the last decade’s explosive transportation shake-ups. Despite settling for a small sum, Marchese said the civil suit may continue. He said he plans to appeal to New York’s high courts, arguing that the entity owning the crash site was also liable. Marchese said he’s not planning to take any attorney’s fees from Green’s settlement. “She has never been a ‘poor me’ type of plaintiff,” he said.